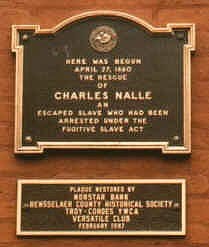 This plaque on State Street in Troy marks the spot where citizens of the Collar City forcibly freed Charles Nalle from custody. Of course, they were in violation of the Fugitive Slave Law. Charles Nalle was born in 1821 in slavery in Stevensberg, Virginia. At 16 he was given over to Blucher Hansborough, the son of a Virginia planter. Hansborough also acquired other members of Nalle's family. At a later time, when hard times had befallen Hansborough, he decided to auction off his slaves. At this time Nalle chose to flee, rather than risk being sold south and away from the family and relations he had developed. Nalle and another slave, Jim Banks, arranged a plan that they felt would allow them to escape and later be reunited with their families in freedom. They made their escape in October 1858. Nalle later found work with Uri Gilbert. Gilbert was a leading industrialist in Troy. Nalle began living in Troy with the family of William Henry. Henry was a black grocer in Troy. He was also a member of the Vigilance Committee. Nalle was on his way to the bakery when he was arrested by U. S. Deputy Marshall John W. Holmes and Henry Wale, a slave catcher from Stevensberg, Virginia in the employ of Blucher Hansborough. This was April 27, 1860. When friends noticed his disappearance they searched for him and quickly discovered what had happened. He had been taken before the U. S. Commissioner to get authorization to take him back south. The local vigilance committee swung into action and a crowd quickly gathered at the U. S. Commissioner's office. They were looking for an opportunity to free Nalle. As it happened, Harriet Tubman was in the area to visit relatives. She took aggressive steps to engage the situation. The ensuing struggle is recounted in local newspapers of the time and in Harriet Tubman's biography by Sarah Bradford. It is also shared in a well researched article by local writer Scott Christianson in the Winter 1997 issue of American Legacy Magazine, a magazine of African American History. Nalle was freed by the intervention of Tubman and the Vigilance Committee. He escaped to Niskayuna where he stayed in a secret location until it was regarded as safe for his return to Troy. Friends raised funds to buy his freedom. The lane was opened, and the man was brought out -- a tall, handsome, intelligent man, with his wrists manacled together, walking between the U. S. Marshal and another officer, and behind him his brother and his master, so like him that one could hardly be told from the other. The moment they appeared, Harriet roused from her stooping posture, threw up a window, and cried to her friends: "Here he comes -- take him!" and then darted down the stairs like a wild-cat. She seized one officer and pulled him down, then another, and tore him away from the man ; and keeping her arms about the slave, she cried to her friends: “Drag us out! Drag him to the river! Drown him! but don't let them have him!" They were knocked down together, and while down, she tore off her sun-bonnet and tied it on the head of the fugitive. When he rose, only his head could be seen, and amid the surging mass of people the slave was no longer recognized, while the master appeared like the slave. Again and again they were knocked down, the poor slave utterly helpless, with his manacled wrists, streaming with blood. Harriet's outer clothes were torn from her, and even her stout shoes were pulled from her feet, yet she never relinquished her hold of the man, till she had dragged him to the river, where he was tumbled into a boat, Harriet following in a ferry-boat to the other side. But the telegraph was ahead of them, and as soon as they landed he was seized and hurried from her sight. After a time, some school children came hurrying along, and to her anxious inquiries they answered, "He is up in that house, in the third story." Harriet rushed up to the place. Some men were attempting to make their way up the stairs. The officers were firing down, and two men were lying on the stairs, who had been shot. Over their bodies our heroine rushed, and with the help of others burst open the door of the room, and dragged out the fugitive, whom Harriet carried down stairs in her arms. A gentleman who was riding by with a fine horse, stopped to ask what the disturbance meant; and on hearing the story, his sympathies seemed to be thoroughly aroused; he sprang from his wagon, calling out, "That is a blood-horse, drive him till be drops."  The poor man was hurried in; some of his friends jumped in after him, and drove at the most rapid rate to Schenectady. [His freedom was later purchased].